3.2mil Matte White Translucent vinyl 60" x 150' - 5yr. 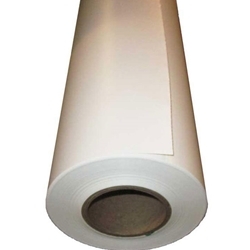 Concept 224 is a 3.2 mil premium white translucent calendared PVC film coated with clear 200-5025 permanent acrylic pressure sensitive adhesive laminated to a 90# layflat liner. This vinyl film is designed to accept a variety of solvent based inkjet and UV curable inks common to wide format digital printing systems. Concept 224 may be printed using other common printing processes such as UV curable screen and UV curable offset but must be tested before production. Concept 224 is a premium decal film designed for permanent interior or exterior signage applied to illuminated substrates such as polycarbonate, styrene and acrylic sheeting.